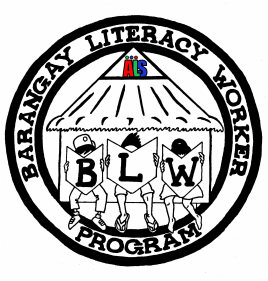 ​Barangay Literacy Workers, or BLWs, are volunteers working under the auspices of DepEd’s Alternative Learning System. Their job is to deliver literacy and livelihood classes to illiterate, neoliterate, and out-of-school youth and adults. BLWs are residents of the barangay in which they work*, must be at least 18 years of age, and must possess at least a high school diploma. They are required to dedicate at least 16 hours per week to the delivery of ALS programs, which include the Basic Literacy Program, and the Elementary and Secondary Accreditation and Equivalency (A&E) Programs. The BLW Program was conceived as a means of supplementing the existing ALS workforce, which struggles to reach the tens of thousands of people throughout the province of Camarines Sur who have not completed their education. BLWs bring ALS educational programs into far-flung barangays; without them, many people would be unable to access such programs due to the costly and time-consuming nature of travelling into poblacion. BLWs deliver free and flexible classes to the most vulnerable and marginalized people in their communities, such as young mothers who were forced to drop out of the formal school system to take care of their children, people with disabilities (PWDs), and those facing serious financial hardship. Classes are conducted in barangay halls and local parishes, and even in people’s homes. BLWs play an essential role in DepEd’s mission to provide quality education to all Filipinos regardless of age, location, or financial status. *The BLW must be a resident of the barangay they service unless they are serving a 'cluster' of barangays; in this case, the BLW must be a resident of at least one of these. HOW IS THE BLW PROGRAM FUNDED? In December 2015, the Provincial Government of Camarines Sur passed an ordinance (No. 056 of 2015 Series) stipulating the funding requirements and sources of funding for the BLW Program. All barangays and municipalities have been encouraged by the Provincial Government to adopt and implement the Provincial Ordinance. The honorarium for the BLW should be funded by the barangay the BLW is servicing. Should the barangay not have sufficient funds, the municipal government may also contribute to the BLW honorarium and learning material costs. Furthermore, the barangay can request support from Provincial Government. If you are reading this and are an official from the barangay or municipality, we encourage you to sponsor a resolution to adopt the Provincial Ordinance. We have included a copy below. You can also find out more about how the BLW Program is implemented in the "For ALS Implementers" section of this website. Why is DepEd in need of PRIVATE Sponsors? ALS CamSur has been very busy over the past year liaising with barangay councils and LGUs to secure funding for the BLW Program. Some municipalities have generously supported the initiative, but there is still a long way to go before the BLW Program is fully funded across the province. This is why we need the help of private sponsors! Ideally, BLWs should be recognised for their service with a small honorarium of PHP1000 per month from their barangay council; however, many barangays struggle to afford this recommended amount and consequently miss out on the many social and economic benefits generated by having their own BLW. This is why we have created the ‘Sponsor a BLW’ initiative. Basic education is a fundamental human right, enshrined in the 1987 Philippine Constitution. All Filipinos, especially those who are less privileged, should have knowledge of, access to, and the opportunity to participate in educational programs that allow them to achieve their personal learning goals and, therefore, their unique potential. If you are interested in sponsoring a BLW in your community, read on! ​Ideally, Barangay Literacy Workers receive a small honorarium of PHP1,000 per month over 12 months for their services to the community. Below, we have listed a range of sponsorship packages, which will enable barangays to employ their own BLW and help to give out-of-school youth and adults a second chance to complete their education. Your support will be invaluable to these communities! If you wish to sponsor a BLW for six months, we recommend a donation of PHP6,500. (i.e. PHP1000 per month for 6 months, plus PHP 500 for learning materials). If you wish to sponsor a BLW for three months, we recommend a donation of PHP3,250. (i.e. PHP1000 per month for 3 months, plus PHP250 for learning materials). If you wish to sponsor half your BLWs honorarium over 12 months, we recommend a donation of PHP6,500 (i.e. PHP500 per month for 12 months, plus PHP500 for learning materials). If you wish to sponsor a BLW to help them pay for essential learning materials, such as pens, pencils, paper, chalk, eraser, stapler, glue, folders, etc., we recommend a donation of PHP1,000.